Cover art by Chris Brunner. We often read hoping to see a piece of ourselves reflected in stories, but it’s the surprising connections that can have the most impact. 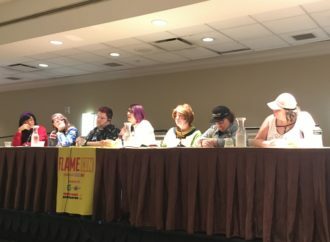 These connections are not always comfortable, but are often invaluable, such as Jennifer Gonzalez’s experience with depression and Katie O’Neill’s webcomic Mushrooms. Each time readers respond powerfully to comics such as O’Neill’s it can be a unique community building moment that reveals comics’ ability to capture the abstract, an ability that Sage Coffey and Liz Enright will highlight in their anthology Sweaty Palms. 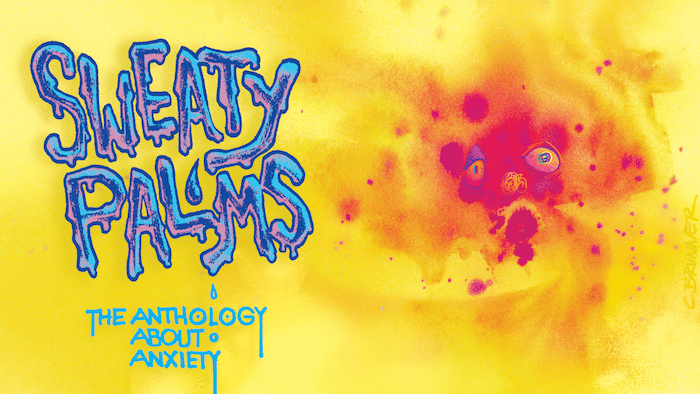 Sweaty Palms collects autobiographical comics about anxiety and features over fifty storytellers whose comics can help de-stigmatize mental illness. 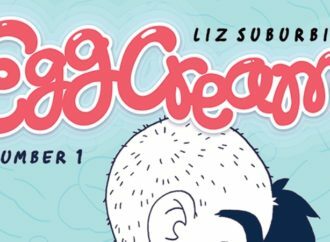 Coffey and Enright are currently Kickstarting the zine and graciously chatted with me about some of the nitty-gritty work behind curating a massive anthology and what it is about comics that allows artists to convey experiences with mental illness so beautifully. What inspired you to create Sweaty Palms? Liz: Wow, I hate to start this off on a miserable note, but I’ve got to be honest. Things got pretty bleak for me last year. I lost my dad weeks before starting grad school, and instead of dealing with the grief, I allowed work to consume me. It didn’t help that I was totally broke. The stress from it all provided me with no good reason to leave the house. Out of shame, I stopped going out with friends and calling family. How could they possibly like me if they saw me floundering? That’s the kind of mindset I was in. As easy as it was to blame my unavailability on the schoolwork, the excuses only made me feel worse. That period of loneliness and isolation was frightening. I knew something had to change, but the emotional hurdles seemed insurmountable. Sage was sweet enough to come over for a work party when I was still too nervous to leave my apartment. It was like dipping my toe in human interaction from my comfort zone, but still a positive step. When we started catching up and talking about our worries it became clear that we could easily fill an entire book with stories about anxiety. By the next morning, we’d already compiled a list of names of artists we wanted on the project. It’s been a rewarding and healing experience that I’m proud to be a part of. Sage: There are tons of reasons. [Laughs] The conception of the idea was late last year when I was on my way to visit Liz for a “work party,” which is just when we work in the same room together. She saw me walking to her place when there was a bus stop literally in front of her apartment. I pulled the bus cord a stop early, but the bus was packed to the brim with people, and I was scared those folks would ridicule me for not getting off at that particular stop. So, I leapt off and walked the rest of the way. Liz had been going through a lot too, and after some discussion we decided that night to bring this project to fruition. Another inspiration for the initial idea to make an anthology about anxiety was my own experience with it. I had ignored my depression and would try to be as outwardly happy as possible. I’d say, I’m still a naturally upbeat person and come off as such, but ignoring those feelings back then was really unhealthy. 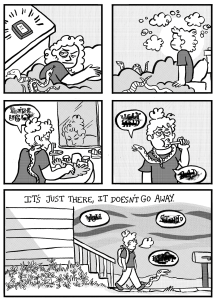 I started doing autobio comics later as a therapy to help me process my feelings and express those negative thoughts in a healthy way! One of the big goals we have for this anthology is to offer a safe place for others to do the same. Comics seem uniquely appropriate for telling stories related to mental health; I’ve seen quite a few strips about mental health go viral on social media because they have such a powerful impact. 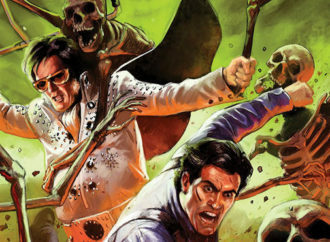 What do you think gives comics that power? 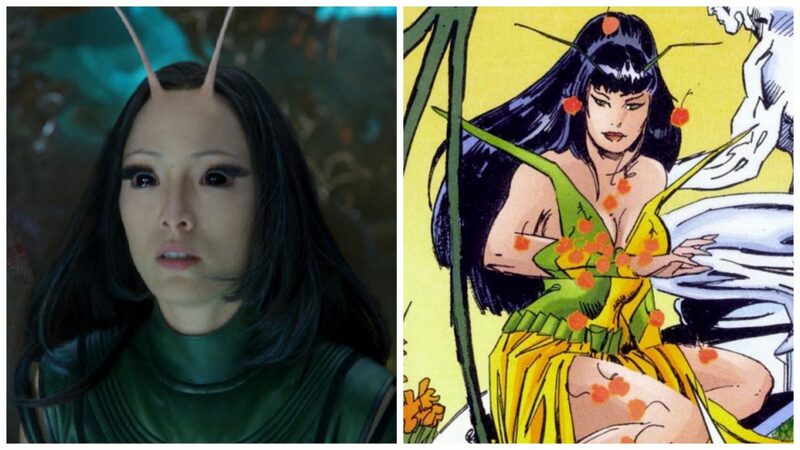 Sage: Comics can communicate things more easily and clearly than words can. I feel like visual representations of mental illness present a stronger and more accurate depiction of what the artist is going through at any given time, because they’re literally showing you what their experience is. Liz: Their popularity speaks volumes! Clearly a large number of people empathize with the sentiment of those comics, even if they are discouraged from talking outwardly about their mental health. A great example is Gemma Corell’s spot-on illustrations for Mental Health America, which are getting a lot of love on social media right now. 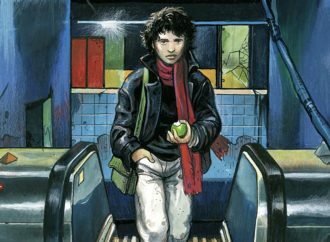 A major reason comics can make such a strong impact is due to reader involvement. 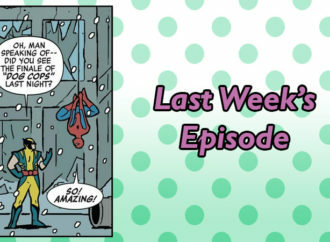 Comics are a carefully composed series of static images that move a story forward, and a lot of that story is suggested in the gutter or the space between panels. Whether we know it or not, as readers, we’re filling in the missing pieces of the story every time we skip from panel-to-panel. We’re active participants who bring our own experiences to the page. 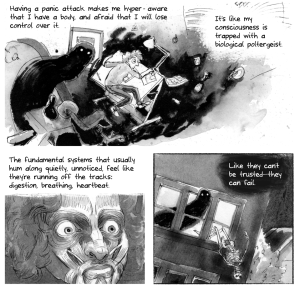 Comics about mental health can simultaneously encourage readers to reflect on their personal struggles while letting them know they’re not alone. 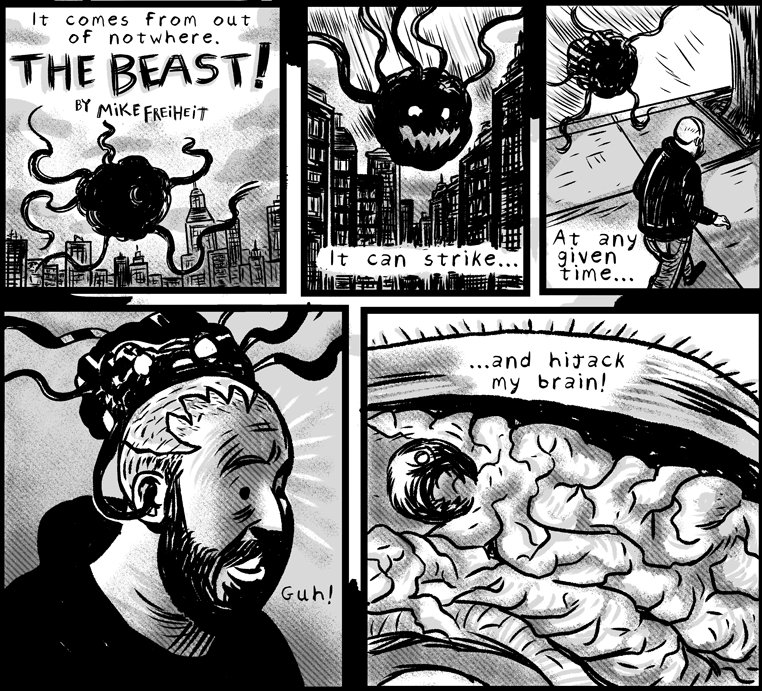 In the previews on the Sweaty Palms Tumblr, there’s a good balance of humor comics and comics with a more serious tone. In a book that will potentially be very emotional, how do you consider tone? Liz: That balance is completely the doing of the contributors. We didn’t want to edit the tone of the story they wanted to tell. It was more important that we help strengthen their intention. Sage and I made sure to mention that humor was 100% okay when we posted the call for submissions, because we didn’t want to discourage artists from applying. There’s almost always a tinge of sadness in comedy. Sage: Individual stories’ tones are up to the contributors behind those particular stories. It was very important to us that the contributors tell their experiences their way. That being said, you can hear each creator’s voice in each submission. Some comics, especially those with a larger page count, have a varied tone! I think the only way we really considered “tone” when editing the anthology was making sure what the artists communicated came across clearly. There are a bunch of wonderful artists in your line-up! Kat Fajardo, Miranda Harmon, Joamette Gil–it’s pretty star-studded. How did you recruit all these lovely creators? Sage: Miranda is actually a pal of mine; we met at FLUKE in Athens a few years back and hit it off! She’s really sweet and easy to talk to, and since then, we’ve been pen pals! We have a handful of invited contributors, but I’d say the rest was complete luck! We did an open call for pitches and narrowed down our choices based on story. Kat and Joamette were among the 103 submissions we went through. We’re very lucky they submitted their beautiful works, and I can’t wait for others to see ‘em once the anthology is out! I can tell you wholeheartedly Kat’s story has already helped me personally! Liz: I ask myself that every day! It’s really an honor to be working with this group of artists. I was surprised to see so many familiar names in the pool, to be honest. It makes us feel like we’re doing something right to have struck a chord with artists who could be spending their time and energy on much bigger/better gigs! There are a lot of contributors in this book, and in the call for submissions, you asked for stories that were between 3 and 12 pages, which seems like a big range. As a reader that’s all really exciting, but how did you balance all the content? Liz: It’s been a challenge trying to figure out the best order to present the stories in because of the variety in length and tone. Then again, we have to remind ourselves that it’s a puzzle like any other part of the creative process! Adjustments to the page count happened organically through feedback and conversations with contributors. Some moments needed room to breath and pages were added. The pacing in other stories was off, so pages and panels were stripped away. All edits were made in service to the story. Sage: It was hard sometimes and easy others! I feel like that comes along with any project, though. We wanted to make sure if it was a 12 page story, it needed all 12 pages. Some situations are just too complicated to explain in the typical 1-3 pages. Others find the lower page count fits their experience perfectly! It’s important to have a wider page range for such a different array of experiences. One of the fun things about an anthology is that you get to collect a wide variety of artistic styles under the same cover. Did you look for certain things in terms of the art? Sage: I feel like our only requirement when looking at portfolios was to be able to tell a story clearly! Like you said, having a wide variety of styles is fun, but also important. I feel like if we went in with any particular style in mind we would have hindered that artistic diversity. Liz: The most important thing to us was strong visual storytelling. The project required artists to communicate truly abstract things, like the feeling of anxiousness, with words as well as pictures. In many cases a story’s tone was contemplative, so the artist would have to make sure those quiet moments were visually interesting throughout the piece. A major benefit of collaborating with Sage has been that we each have our own unique taste. It’s resulted in a stylistically diverse anthology that we’re so excited to share with the world! I like the Q&As you’re doing with the Sweaty Palms contributors, and a common question in those Q&As seems to be, “What advice would you give for people who want to get into comics?” I’d like to ask you the same question; what advice would you offer for new cartoonists and writers? Liz: Create the work that you’d like to read. I’ve wasted so much time worrying about what other people find interesting instead of following my inner compass. When you draw what interests you, chances are there’s a group of people out there who will also dig it. Embrace your weirdness and you’ll find an audience! 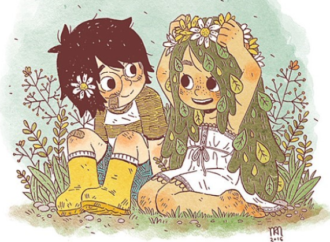 Sage: Keep at it, and share what you have! 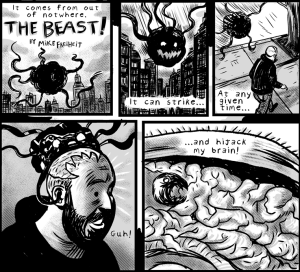 There may be a little voice in your head telling you, “This isn’t good enough,” or, “No one wants to see this,” and let me tell ya, ignoring that voice is one of the best comics decisions I’ve ever made. Your voice matters and what you have to say in your comics does too! Don’t share what you have if you’re under an NDA (non-disclosure agreement) though. Thems the rules. 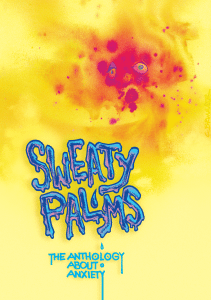 Get a copy of Sweaty Palms by funding the Kickstarter, and learn more about the anthology at the Sweaty Palms Tumblr!